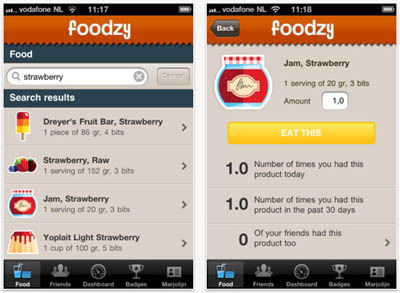 Foodzy is a clever food and health tracking service that launched last year. It basically allows you to keep a close eye on everything you’re eating and drinking via the web, or an app on your iPhone or your Android phone. From there you can closely monitor everything, set goals for yourself, improve your eating habits or even compete against other users. The app’s developers have slowly been adding new features over the past few months, for instance, you can now connect it up with a Withings Wi-Fi body scale so it keeps track of your weight automatically. However, this week Foodzy has added a clever new feature called Eatzies, which makes it easier than ever for you to track everything you eat, especially big dishes as apposed to single products. If you’ve ever tried a food tracking service before (or even just counted calories yourself), you know how hard it can be to figure out what’s in a big meal. Well now Eatzies combines separate products for you into a recipe or frequently eaten dish, so you just need to add the right amount of each ingredient once to make it an Eatzy. Cute, huh? That way next time you eat it you can check in to that same recipe, in the same way you would with an app like Foursquare, just with one simple click instead of adding everything one by one. Eatzies also now allows users to share their recipes and random concoctions on social networks and collect together others to make later, allowing you to see when friends have checked in (i.e. eaten) the recipes you’ve dreamed up! The main problem with services like Foodzy is that many people are really put off by having to input every little piece of food they’ve eaten throughout the day. Although you certainly still need to do some of the work with the new Eatzies feature, it does make it a little simpler to track what you’re eating, especially if you’re a bit dull and have the same dish night after night. Check out Foodzy for more information about your Eatzies.